Speed Demon Video Slot Guide & Review - Casino Answers! Speed Demon is a 5-reel, 30-line video slot found at Random Logic casinos, featuring a wild substitute symbol, scatter wins, multipliers, a free spins feature and a bonus game. You can play the Speed Demon video slot at Bovada. Bets on the Speed Demon slot machine are $0.05, $0.10, $0.25, $0.50, $0.75, $1, $2, $5 and $10 per line. You can select from 1-30 paylines on Speed Demon. Speed Demon is a nickel slot, so you can bet anywhere from 5 cents up to $300 per spin. Speed Demon has a very good betting range, so both casual players and high rollers can find suitable wagers to play. To play the Speed Demon slot game, use the “Max Lines” button to play all 30 lines. For other wagers, select your bet and press the “Spin” button. The highest paying symbol on the Speed Demon video slot is the F1 Car. 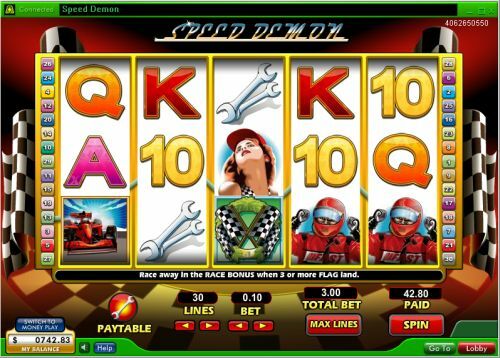 If 5 F1 Car symbols land on the reels of the Speed Demon online slot, you will win the 7500 coin top jackpot. The F1 Car symbol is wild and will substitute for all other symbols except for the Scattered Checkered Flag symbol. The second highest paying symbol is the Driver symbol, which can pay up to 1500 coins. When the F1 Car wild symbol appears on reels 1 and 5 at the same time, you will win 15 free spins with a 2X multiplier. During the free spins feature, all of the prizes are doubled. The free spins feature can be re-triggered. The free spins feature is played at the lines and bet of the triggering spin. Free spin wins are added to payline and scatter wins. Win lots of cash using this free spins feature when you play Speed Demon at Bovada! Speed Demon’s scatter symbol is the Checkered Flag symbol. 2, 3, 4 or 5 Scattered Checkered Flag symbols from left to right will pay 1X, 5X, 20X or 100X your total bet. When 3 or more Scattered Checkered Flag symbols appear from left to right, you will trigger the Racing bonus game. You will get to play 3 races over 1/4 mile. Prizes will be awarded for the time it takes you to complete each race. All prizes are multiplied by the triggering bet. The Speed Demon bonus game can be triggered during the free spins feature. Speed Demon feature wins are added to payline and scatter wins. Payouts are made according to the Paytable. Payline wins are multiplied by the bet per line. Scatter wins are multiplied by the total bet. Highest win only on each selected payline. Coinciding wins on different paylines are added. All symbols pay left to right, including the Scattered Checkered Flag symbol. The F1 Car symbol will substitute for all symbols except for the Scattered Checkered Flag. 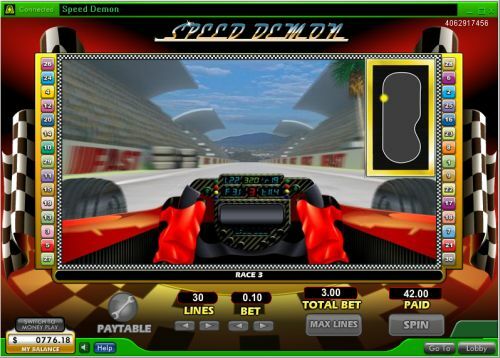 Fans of F1 racing will love the Speed Demon video slot. It has some very good payouts, a free spins feature and a bonus game. The bonus game is excellent, but it is very difficult to trigger. That is the main drawback of the Speed Demon online slot game. If you like to live in the fast lane, then burn rubber and play Speed Demon today by signing up at Bovada! Can players from the United States play the Speed Demon slot game for real money? Unfortunately, American players cannot play Speed Demon for real money. If you would like to play another great auto racing slot, you can check out our Green Light Video Slot Review or play it at Bovada. Where can I play an Instant Play version of the Speed Demon online slot? For a free Flash game of the Speed Demon video slot, please visit 888 Casino. You can play in practice play for free or you can play for real money. If you have any problems with the Instant Play software, make sure you download the most recent version of Adobe Flash Player. Where can I play more auto racing slot games? For more auto racing as well as any other sports slot, you can read our complete list of sports-themed online slot games.